Do you need an inexpensive date idea? Why not do what we do and have fun playing games. 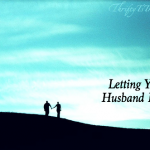 These 2 player games are perfect for teens, new couples and even old married couples like us. Plan ahead for a stay at home date night on the cheap. 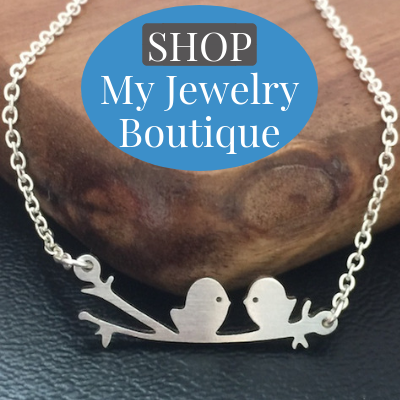 You’ll never guess which one’s our favorite! Trent and I love to play games! We’re both a bit competitive and sometimes a second round is started just so the loser can try again. Need a date idea? Why not do what we do and have fun playing games. Whether you’re planning a stay-at-home date night or are planning ahead and need ideas for a future impromptu date night, these 2 player games are perfect! 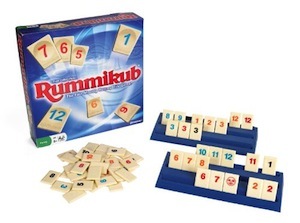 Rummikub – Each player takes turns combining tiles with various numbers and colors and playing them as runs or sets. As your opponent is making his move, come up with a strategy that will help you get rid of all of your tiles (hopefully you’ll draw the wild-card joker to increase your luck). The first person to empty their tile rack wins the game. Jenga – And the walls came tumbling down!!! Take turns removing one block at a time from the 54 block tower. 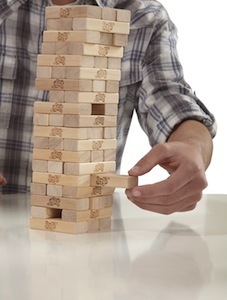 Jenga will have you on the edge of your seat -as you pull your block and hope that the tower doesn’t come crashing down! The winner is the last player to remove a block without causing the tower to collapse. 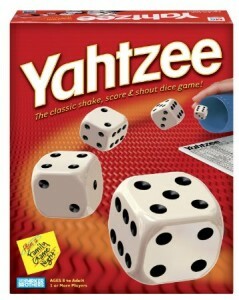 Yahtzee – This dice game is a game of luck (if you ask me). On your turn, roll the dice three times in hopes of getting Yahtzee (five of a kind). Don’t get your hopes crushed if you only get points for the other 12 categories (large straight, full house, etc.). Not sure how you’ll keep track of everything? The game comes with a scorecard to keep everything neat and organized! If you’re a risk taker, you’ll have a blast going for the bonus Yahtzee! 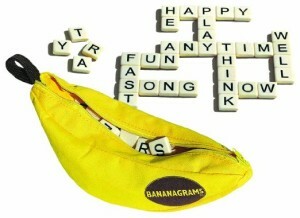 But you have to promise to scream Yahtzee when you roll it! 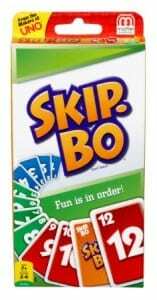 Skip Bo – Are you ready for the ultimate game of sequence? Each player starts the game with a pile of 30 cards. On your turn, draw five cards. Build piles in the shared playing area by using either the cards in your hand, the card from the top of your pile, or the top card from your four discard piles. The tricky part is that piles must be formed in sequential order starting at 1 or with a Skip Bo. Be the first player to get rid of your entire pile of 30 cards and you’ll win the game! 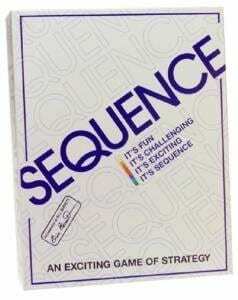 Sequence – What do you get when you mix poker chips and cards with a board game – Sequence! Choose a card from your hand and place one of your poker chips on a corresponding space on the board. The strategy begins as you must also block your opponents and remove their chips. The first player with five in a row gets sequence and wins the game! 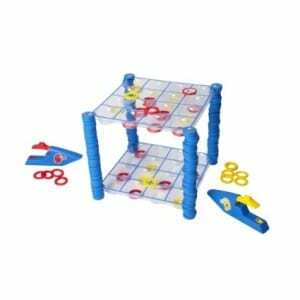 Connect Four Launchers – You had a blast playing Connect Four as a child, and you can expect to love Connect Four Launchers as an adult! Load your launcher, aim and fire your checkers to get four in a row. You’ll love the head-to-head action as you race to win! 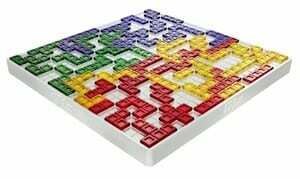 Blokus – This fast-paced game of strategy has endless possibilities! Each player takes turns placing their pieces on the board. But there’s a catch! Each new piece played must touch another piece of the same color, but only corner-to-corner contact is allowed. The game’s score is based on whether or not you played all of your pieces plus the number of squares in your unplayed pieces. Let the strategy begin! 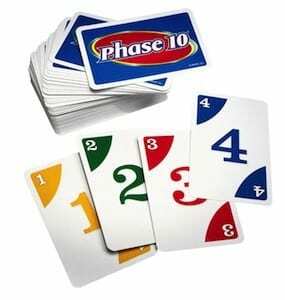 Phase 10 – This rummy-type game is one that is highly addictive. I’ll go ahead and admit that Trent and I get quite competitive when we play this card game! Players must go through 10 different phases (runs or sets as specified on the phase card). If you don’t complete your phase but your opponent does, they get to move on to the next phase while you get left behind until you complete the phase you are on. Don’t worry – there will be plenty of opportunities to catch up later. The first player to complete all 10 phases wins! 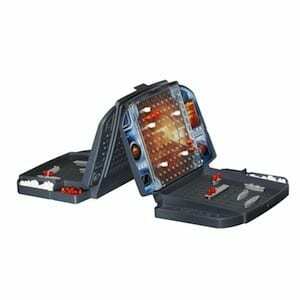 Battleship – Are you ready for head-to-head battle? Each player places his ships on his portable battle case. Locate your enemy’s opponent’s ships by calling out their positions, placing red and white pegs on your battle case to remember where you’ve launched your attacks. The first person to destroy all five of their opponent’s ships wins the game. Bombs away!!! 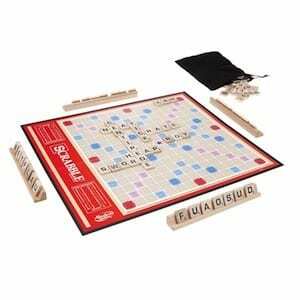 Scrabble – Players take turns using lettered tiles to form words, placing them on the game board and earning points for each piece played. Rack up the points by taking advantage of the premium squares that give extra points. The rules state that words must be defined in a standard dictionary, but you’ll want to watch out for cheaters that want to make up words of their own! 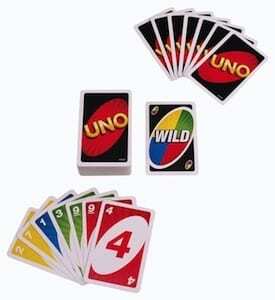 UNO – This wonderful card game is not just for the little kids, but perfect for big kids too! 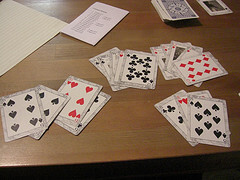 Players take turns playing from the cards in their hand by playing the same color or numbered card in the discard pile. Watch out for the Draw Two, Skip, Reverse and Wild cards as they can change the course of the game. When you have one card remaining in your hand, make sure to shout out UNO. If you don’t and your opponent catches you you’ll have to draw two cards! The first person to get rid of all of their cards wins! 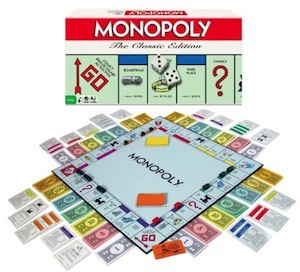 Monopoly – Grab your cash, roll the dice to make your way around the board and get ready to dominate the market as you purchase properties. You’ll not only collect rent on your properties when your opponent lands on them but you’ll also get $200 every time you pass GO! You never know what you might draw with the Community Chest and Chance cards – you may win a contest, be taken to a certain spot on the board or be forced to pay the other players. Do your best to avoid the Property and Luxury Tax spaces because they can get costly. The player with the most money/properties wins the game! Tip: The trick to winning the game is to buy as many properties as you can get your hands on. 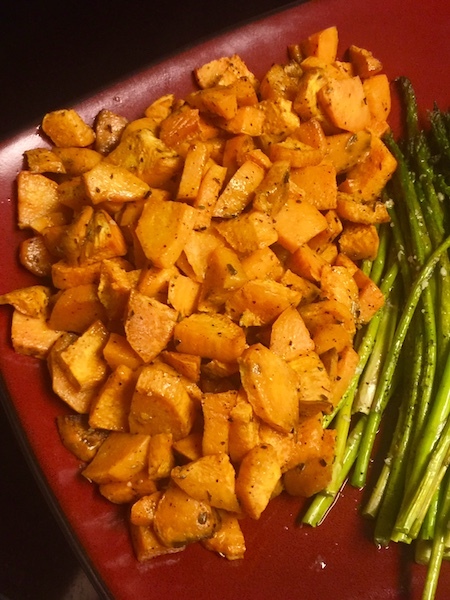 Shhh…don’t tell Trent that I shared his secret! 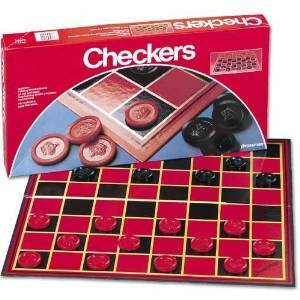 Checkers – Each player moves their pieces diagonally across the game board with the object of reaching the other side and getting crowned. The game is won when you capture your opponent’s pieces or when no moves are left! 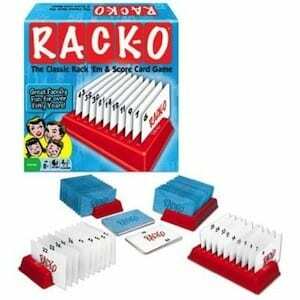 Racko – This simple game takes a bit of skill, luck and concentration! Each player is dealt 10 cards. As the cards are being dealt he must place them in his rack beginning with the highest spot on his rack, #10. The goal of each hand is to race to see who can put all 10 cards in numerical sequence by drawing and discarding additional cards. When you get all 10 cards in ascending order, call Rack-O and you’ve won the game! Mexican Train Dominoes – (In my best conductor voice.) All Aboard!!!! On your turn, play one domino and begin to form your “Train.” When you’re unable to play on your train it becomes a “Public Train” that your opponent can now play on. 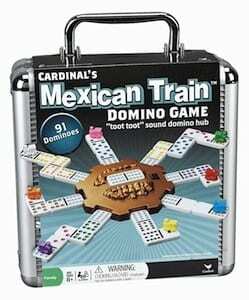 You can also ride the Mexican Train which is a train that you can place your dominoes on at any time during the game. The first person to play all of their dominoes wins! 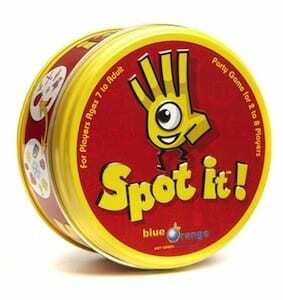 Spot It – You’ll need to be fast to win at this matching game. Between all 55 cards, there is always one matching symbol between any two cards. Be the first to find that symbol and win! Mix up the gameplay by choosing from the five various ways to play! Let the concentration begin! Chess – Prepare yourself for the ultimate game of strategy! 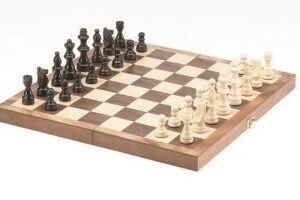 Use your king, queen, rooks, knights, bishops and pawns to capture (checkmate) your opponent’s king while keeping your own pieces from being attacked. Think it sounds easy? It’s not because each piece moves in a different direction. Rummy – Grab your playing cards and enjoy a few rounds of Rummy! Take turns forming runs or sets with your playing cards. The first person to play all of their cards and go out wins the round. At the end of each round, points are tallied with the winner of that round getting additional points. If you’re feeling risky, you can attempt to get Rummy by holding all of your cards and playing them at once. But be forewarned as that play could come back to bite you in the tooty! Reader Tip: For a bit of a challenge, make the Jokers “wild” or deuces (gives you 4 wild cards versus the 2 Jokers). What are your favorite 2 player games for date night?